Sharing her journey from bedridden patient to inspired healer, Robbie Holz recounts her recovery from hepatitis C, fibromyalgia, and treatment-induced brain damage, as well as the blossoming of her own healing powers, through her work with her husband, the late healer Gary Holz, and her experiences with a remote tribe in the Outback of Australia. Robbie describes many of the miraculous healings she witnessed while working with Gary in his Aboriginal-inspired healing practice. She details the powers that Gary developed after his transformative time being healed by Aborigines, including telepathy, seeing the inner workings of his patients’ bodies, and channeling the healing energy of the universe. She discloses how Gary accessed the Dreamtime, the energy field that is the source of reality, and reveals how her work with Gary led her to an invitation to participate in secret Aboriginal women’s ceremonies in the harsh Outback desert, where her own healing powers blossomed. 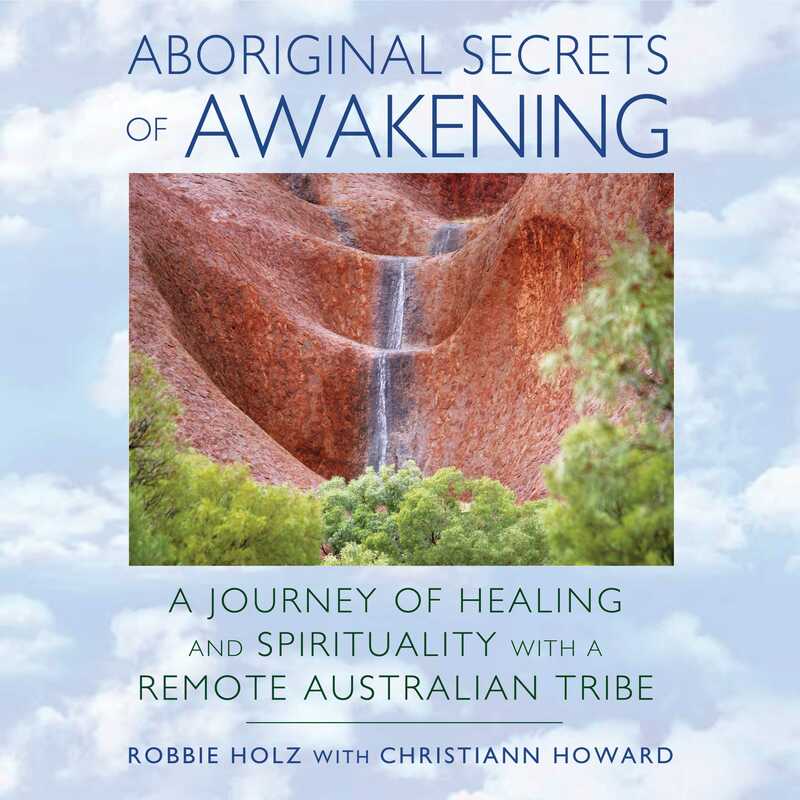 Through her story of healing and discovery, Robbie describes principles from the 60,000-year-old Aboriginal culture that can help create transformation in your life. She explains how she became aware of her team of spirit guides, who provide unwavering support and unconditional love through each of life’s struggles. She shares the tenderness of her husband’s final moments and how she worked past her grief to transform her relationship with him, enabling him to become an active, loving part of her spirit team and partner in her healing work. The ceremonies built in intensity, each one more powerful than the one before it. I was walking around in a glow of gratitude to Mother Earth. Today was our last day for ceremony. I tried not to have expectations, but I sensed something big was about to happen. I spent most of the morning wondering what it would be. “Ceremony! Ceremony!” Melody yelled from the far end of the camp. Looks like I’m about to find out, I thought, as I pulled off my clothes and stepped into my dusty black skirt. Determined not to be late for ceremony today, still yanking up my skirt I ran toward the Aborigines’ side of the camp. Uncharacteristically, I was one of the first to arrive. I sat front and center at the edge of the ceremony site where the Aborigines would be dancing. Best seat in the house, I thought. How perfect for my last day. It didn’t take long for the other women to arrive. We were all naked except for our long black skirts. Gazing around, I marveled at seeing such a wide range of radiant skin colors represented. Between the white women and the Aborigines, we were fair skinned to dark ebony and everything in between. I shifted my legs underneath me as I settled my body into the sandy dirt. The Aborigines started singing in their native tongue. A few of the white women started clapping to the beat. It was fascinating watching the dancers. Despite the discomfort of sitting in the hot sun with my back aching, I was spellbound. I couldn’t understand what the Aborigines were singing, but through their powerful song and dance they were able to convey gratitude. I felt warmth intensifying inside me. Huge waves of gratitude were welling up and rippling through my body. I noticed a large dragonfly hovering close to the head of one of the dancing Aborigines. As I stared at it, the dragonfly seemed to blend into the leaves of the scraggly trees behind it, as if it were part of the landscape. Then I noticed the same thing was happening with the dancing Aborigines. They were blending into the background of large red rocks and puffy white clouds in the bright blue sky. Everything shimmered and seemed to melt together. Although I could distinctly see each object, it felt as if there was no separation between them. Each person and object rolled off infinitely into the next and the next and the next. I felt a sense of boundless interconnectedness between everything. My heart began to expand until it expanded far beyond my body. I felt intense love and compassion flowing from it. An airy feeling came over me, as if there was no time and space. This went beyond any intellectual knowing--I could feel there was no time and space! I lost all sense of where I began and ended. It felt like everything was interconnected in a timeless, boundless consciousness. And I knew, with the kind of knowing that encompasses your whole being, that I was part of this infinite consciousness. In an instant I knew this One-Consciousness wasn’t only within me and everything around me, it stretched infinitely beyond the cosmos, beyond our universe. The intensity of the love coming from this interconnected consciousness struck me to the heart. After several minutes, I took a deep breath and placed my hands on my heart. Thank you, thank you, thank you, my dear Aboriginal brethren, for helping me feel the loving consciousness that is a part of me, I said silently. Pulling my knees toward my chest, I wrapped my arms around my legs and basked in the delicious glow of the moment. I closed my eyes and listened to the beautiful singing with indiscernible lyrics but a meaning I could clearly feel in my heart. As the ceremony ended we walked back in silence to our campground. A half hour later as I approached the makeshift kitchen a loud ping caught my attention. There was a second loud ping as another heavy raindrop hit the metal roof of the chuck wagon that held our food supplies. Within seconds, the metal roof was filled with loud dancing raindrops bouncing off the top. As a loud crack of thunder sounded overhead, I ran to take shelter in the tent I shared with Karyn. I was caught in a downpour before I reached the tent. The warm rain felt so good against my dirty hair and skin. I reached out my arms and looked up at the dark clouds overhead and let it pour over me. The storms were intense and lasted many hours. It was a tremendous downpour. We watched the rolling purple, blue, and gray clouds and sheets of rain circling the camp. It poured on us for a while and then moved off across the flat desert to the horizon, the lightning flashes and thunder rumbles reaching us from far away. Then the storm turned and approached the camp again. As it hit, we ducked for cover and crowded inside the truck and Jeep like clowns stuffed in a circus car. This pattern repeated over and over. Sometimes we stood outside and enjoyed the rain on our matted hair and filthy bodies. When the clouds moved away, we stood on top of the truck to see Uluru in its glorious purple color. In this land of constant sun, Uluru was normally colored orange. Seeing it in its purple regalia was a rare sight. The rain went on into the night. For the Aborigines there was also a spiritual aspect to thunderstorms. The lightning rebalances the world and the rain cleanses. I think all of us felt the renewal. I learned later, from a hotel clerk, that the desert had not seen such storms for many years. Karyn told me that the Aboriginal women felt the white women’s spiritual energy had greatly improved the strength of this year’s storms. Robbie Holz is a holistic health consultant dedicated to continuing the healing work of her late husband. She healed herself of hepatitis C and has worked with Aboriginal healers in Australia. She lives near Seattle. …a humorous, insightful and captivating chronicle of the couple’s healing practice, and the author’s discovery of her own powerful healing abilities.